Tudor Gardens is a small and select development by Hereward Homes comprising a sensitively renovated 4 bedroom historic building, Tudor House and neighbouring new build 4 bedroom house, Garden House. 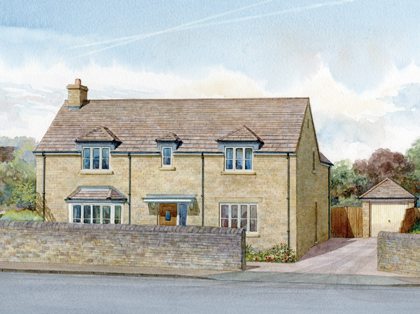 The development is situated in a conservation area within the attractive village of Kings Cliffe. Garden House is a 4 bedroom new build house situated in on Bridge Street, a short distance from the bridge crossing Willow Brook. The house has been carefully designed to incorporate traditional building materials to blend in with surrounding historic properties. With a high specification finish, Garden House offers all the attention to detail as required by discerning homeowners. Tudor House is a Grade II listed two-storey property which is mentioned in ‘An Inventory of Architectural Monuments in North Northamptonshire’. Hereward Homes directors and architects have worked in close partnership with planners and conservation officers to agree a sympathetic approach to breathing new life into the historically important building. The double fronted period property will be transformed into a modern family home whilst retaining its architectural integrity. 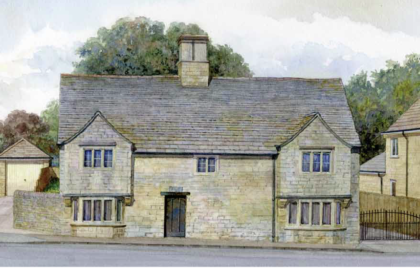 Its double fronted elevation featuring stone mullion windows, Collyweston slate roof and ornate chimney will be refurbished and the living space reconfigured for contemporary living, including a stylish kitchen, 4 bedrooms, bathroom and 2 en suites.